Although I should probably hold my tongue and not criticize the United States on Memorial Day, I must let the U.S. know the truth. Blame Congress, President Obama or the corporations, but the U.S. has dropped the ball. 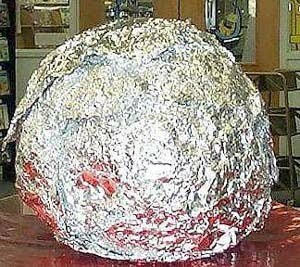 There is a distinct lack of foil balls in our country, and citizens are suffering because of it. Maybe I'm a hypocrite. I have no foil ball. But, honestly, it is the corporations' fault. 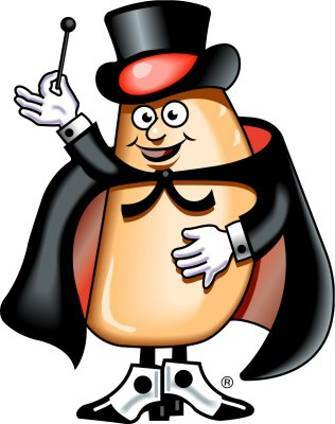 Specifically, I blame the conglomerate called "Hostess" for our country's void of foil balls. I have no evidence to support my following claim, but I suspect Fruit Pie the Magician ruined Ho Hos and foil balls. Back in the early '80s, Hostess sold delectable treats called Ho Hos in aluminum foil. After eating a box of Ho Hos, my brother and I would start a foil ball. Those balls never seemed to grow. I suspect my mom may have quietly thrown them away, but regardless, foil balls were in our life. In the late '80s, Hostess then switched its packaging from aluminum foil to silver, throwaway packaging. That grotesque corporate move meant the end of foil balls in many households, including mine. Nowadays, the U.S. economy is suffering, and so are works of art (AKA big balls). Sure, the world's biggest ball of twine is in Darwin, Minn., and the biggest popcorn ball shines in Sac City, Iowa. But where is the biggest foil ball? A genius blogger watched his foil ball grow between 2004 and 2006, but where is that ball now? Someone named Megan bragged on a message board in March about having a 14-foot foil ball, but where on the Internet is there a picture of it? I am no politician, but I do have a simple five-step quick plan of success for Obama and the U.S.: 1) Clean up oil spill, 2) fix economy, 3) curtail Mideast troops, 4) revamp health-care boondoggle and 5) create foil ball. What are these foil balls for? ha ha ha your an awesome teacher dude!!! !